from The Christian Century, December 3, 1947 (who took it from the “Kagawa Calendar” of 1948). A typical modern state, cumbered with its heavy armament but well-nigh bereft of other values, reminds one of nothing so much as a naked savage, lugging around his javelin and poisoned arrows. States today seem nearer to the stage of barbarism than do many individuals. By the abandonment of war, we in Japan have emerged from the era of barbarism. Thus we have been accorded a chance to make ourselves the most progressive and civilized of all the nations. If only we had done this willingly ten years ago, history would have taken another course. But it is not too late for us. We are going to alter the definition of a “great” state. A truly great state is not necessarily big, nor rich, nor quarrelsome with its neighbors. The great state is the one which is wise, moral and God-fearing. The ideal we pursue is that of making Japan a state with which God can be pleased. Thus may we arrive at the summit of civilization and set an example of a peace-loving state. Though not large, nor rich, nor strong, we may thus become truly great. The theme for this second Sunday in Advent is peace, and today we welcome the coming of the Prince of Peace in Jesus Christ. But have you ever wondered why we call Jesus the Prince of Peace? The “Prince of Peace” is a title which comes from the Book of the Prophet Isaiah. The Christian tradition has applied these messianic titles to Jesus. But in doing so we should not miss how these titles related to the hope of the Hebrew people when they written. Our passage in Isaiah was written about eight centuries before Christ when the Assyrian empire was dominating Judah and Israel and pushing toward Jerusalem from the north. No wonder the people were earnestly hoping for a liberator. But Isaiah was not wishing for a future king some 800 years in the future, but a living liberator. We miss the importance of the text if we read with purely Christian eyes. Our text this morning illustrates what they thought a good King was meant to be. Such a description of the good just king has been called in political philosophy a “mirror of princes”. That means it was a standard by which to judge rulers. Such literature was especially important during the medieval period, when Christian princes were educated to be good just kings in line with sound biblical teaching. Texts such as Isaiah continue to inspire political hopes that a righteous ruler can bring justice to the oppressed. Such a hope was also shared by the Jews at the time of the birth of Jesus. He was born in Palestine at a time of foreign occupation by the Roman Empire. The Jewish people were looking for a saviour from this imperial oppression. Some people thought that John the Baptist was that person. Whoever people thought he was, he attracted large crowds. But in humility he pointed to He who was to come –Jesus Christ. Some people wanted the coming Messiah to rid Palestine of the occupying Roman imperial forces, perhaps with force. But Jesus was no Zealot, he was did not think violence was the way. He rejected the way of violence and resisted the Empire non-violently. That is all very well but does Jesus live up to his title as the Price of Peace? In what way did he embody and live peace? What can the birth of Christ teach us about peace today? 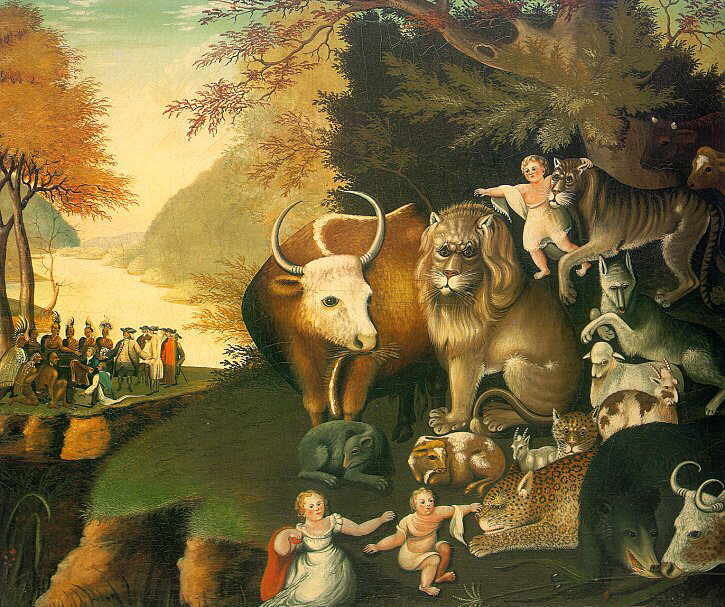 First of all, we can note the similarities between the nativity and the vision of the peaceable kingdom of Isaiah. The animals being at peace in Isaiah is paralleled in the nativity, with animals, kings, and humble shepherds coming together in peace around the manger. In his very birth Jesus shows that he is about peace, foreshadowing his later ministry, and the eschatological expectation of a world at peace. But if you read further in the Gospels he doesn’t speak about peace very often, he talks about the Kingdom of God, but rarely does Jesus speak of peace. Most often when Jesus speaks of peace he uses a blessing such as “Go in Peace” or “Peace be with you.” This may be understood that it this is a personal peace, such as a peace of heart or we should maintain a peaceful spirit. If understood as simply being individually happy and peaceful within oneself, would this be enough for a world torn apart by war and violence? And would it have been enough to inspire two thousand years of action for peace by the church? If we expect more from the Prince of Peace we’d have to consider that we have been conditioned for some other kind of peacemaker by our culture of efficiency, plans, objectives and the organising for peace. Surely it cannot be as simple as being at peace? But perhaps there is a contrast between the way of Jesus and the peace of the world, after all. Sometimes we are told that peace and war are opposed to each other. Others believe that war can be a means to achieve peace. Why else do we send thousands of people to war if not to achieve peace? What else justifies trillions of dollars being spent on weapons on war, if not peace? Others think that peace is not only an end to achieve, but also the means to achieve it. Peace is not only a desirable end to achieve, but is also the only means we can use in order to achieve peace. To this way of thinking, in order to achieve peace, we must be peaceful. This is perhaps what Jesus had in mind when he said “Go in peace” – his peace plan is nothing more than peaceful people. Next year we commemorate the start of World War One, also known as the “four-years war”, the “Great War”, and significantly “the war to end all wars”. It was certainly a Great War with over 16 million killed and about 20 million wounded. But it was not the war to end to end wars. In fact World War One is generally through to have been a primary cause of World War Two, in which an estimated 60 million people were killed. If World War One caused World War Two then this raises the question of whether war leads to more war and not to peace at all. The toll of World War One on New Zealand was huge. We sent over 100,000 troops to conflicts that would ultimately claim the lives of 18,500 New Zealanders and wound another 40,000. These lives are worth remembering. But the church also needs to uphold those next year that opposed war non-violently and spoke out against it, often at great risk to their careers, families, and their lives. They were a witness for peace and the rejection of violent means to achieve it. This week we are farewelling a great man who rejected violent means to achieve peace – Nelson Mandela, the freedom fighter and father of modern South Arica. Mandela is being praised as an inspirational peacemaker by his former enemies. Those who formerly classified him as a terrorist are now lauding him as a hero. It is worth noting that Mandela attended a Methodist School in his youth and also had a Methodist chaplain will in prison on Robben Island. The World Methodist Council recognized Mandela as a “symbol of freedom, justice and peace” when presenting him with its 2000 peace award. His story is well-known: Mandela was convicted of High Treason for his role in opposing apartheid and was condemned to die. Thankfully instead of a death penalty he was held in custody for 27 years, being released in 1990. When he entered prison he was full of hatred for those who kept him imprisoned. But he freed himself from hate. He realized that only by forgiveness could he himself be free and could he free his country from the vicious rule of Apartheid. The rest is history. In some ways Mandela represents one understanding of the Isaiah text in which we read “the leopard shall lie down with the kid.” Edward Hinks, the painter of the “Peaceable Kingdom”, the painting on our order of service, was a Quaker Minister in America in the nineteenth-century. He once preached that people have personalities represented by animals such as the wolf, the leopard, the bear and the lion. But in being redeemed by the Inner Light, they they could become their peaceable opposites: the lamb, the kid, cow and ox. It could be said that the violent Mandela was a leopard; a man prepared to use violence against those he hated. But he grew into a man who non-violently lead his nation to democracy. In his heart the leopard was able to lie down with goat. From that a new South Africa was able to be born peacefully. The reconciliation in South Arica would not have been possible without reconciliation within Mandela’s own heart. One of the things that makes for peace in our world is peace in our own heart. Jesus knew this – peace between nations requires people of peace in the home, in schools, in workplaces, and at all levels of society – even in prison. But we should not forget that South Africa is still a troubled land, with harsh poverty and great inequality, with leaders who many think are putting their own interests before that of the nation. Our Isaiah text not only holds up this image of the peace within, but upholds the people’s hope for liberation from oppression. Even as the Prince of Peace, Jesus did not have a peace plan. But he has a plan and a challenge for us, as he has for every Christian and every church. That is that we are to be peacemakers. We are to go in peace. It is a temptation to think that peace happens between governments, brokered by high-flying diplomats jetting to meetings at the United Nations. These may do some good, but Jesus does not let us off the hook by thinking that we have no responsibility for peace. Jesus did not have a peace plan, but he does call us to follow him in building up the Kingdom and to choose those other things that make for peace. The things that make for peace? What are they? We aren’t really told much about that either. They need to be discovered in each generation, in each location, and in each individual. Doing so requires that we have a spirit of peace. My prayer for us this morning is that Jesus’s spirit of peace grows in us this Advent season, just as the baby Jesus grows in Mary’s womb. Today I picked up a second hand copy of Men of Faith and Courage: The Official History of the Royal New Zealand Chaplains Department by J. Bryant Haigh (1983). As one would expect of an official history it is full of boring lists of names and events. But certain passages are revealing of the assumptions concerning Christianity’s relationship to issues of war and peace. What I find interesting about these quotes is that we start with the presumption that Christians can be warriors, and only later is there an aberration, indeed the curse of pacifism, which made recruiting chaplains difficult. While obviously this is an official history, it is surprising to see pacifism (often based in Jesus’s Sermon on the Mount) as the later inconvenience, and not Constantianism as the new deviant form of Christianity.